Snacking can be a problem for me so it is important that I find Weight Watchers recipes that keep my points low! 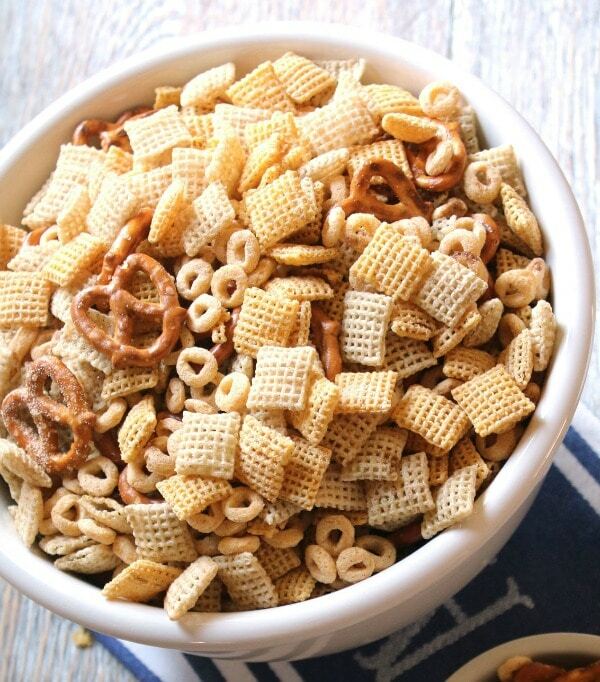 Crunchy snacks are my favorite and this Weight Watchers Chex Mix is so good you won't miss the calories! My mom has been making homemade chex mix since I was a kid and I have always loved the way she makes it! She adds lots of Worcestershire sauce and makes sure the mix is nice and crunchy. YUM! 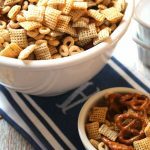 This Weight Watchers Chex Mix recipe is a healthier version, but still delicious to snack on when that craving hits. Preheat the oven to 200 degrees F. Yes…a low heat is the key to a great result! Mix all the cereal together. You can do this is a big bowl or just mix them on the sheet pan you will bake them on. Cover the sheet pan evenly with the cereal mixture. Grab your butter cooking spray and spray a light coat on the top of the mixture. Go ahead and drizzle the Worcestershire sauce over the cereal mixture. In a small bowl combine the other seasonings and sprinkle over the cereal mixture. This needs to bake for about and 1 and 1/2 hours…but it needs to be stirred and moved around every 30 minutes!! Don't let it bake for 1.5 hours straight!!! You will not like the results at all if you forget to stir it. When this is done cooking allow the Weight Watchers Chex Mix to cool and store any leftovers in an airtight container. Okay…you may be wondering why there are pretzels in the photos but none are listed in the directions. Well it is simple…after making this I realized that I didn't want to use all the points that pretzels cost. Pretzels are really high in points!! So I calculated this without the pretzels. If you want to add some in be sure to count the points. 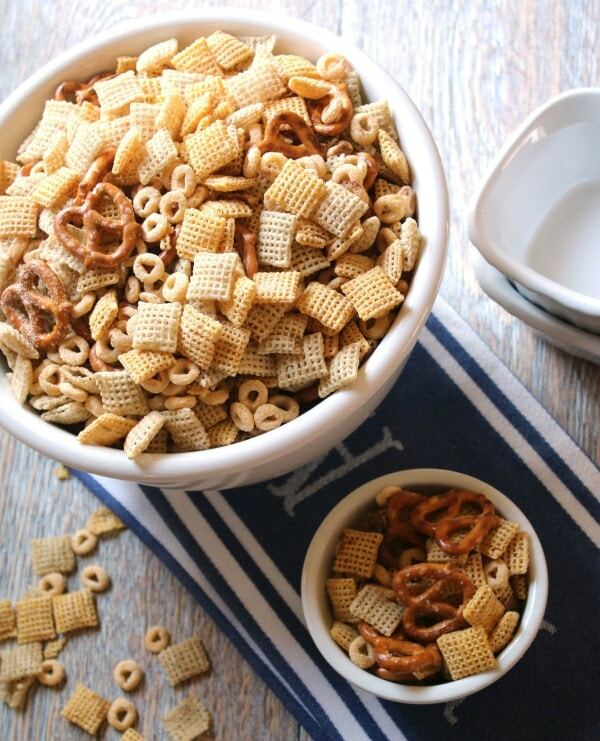 Without the pretzels this Weight Watchers Chex Mix is only 3 Freestyle SmartPoints per cup serving. That is a pretty low crunchy snack. I don't miss the pretzels…but you might. You may also want to add nuts and those will also need to be added into your points total. Let me know how you like it! Remember you can always use more or less of the Worcestershire sauce and spices depending on your personal preferences. 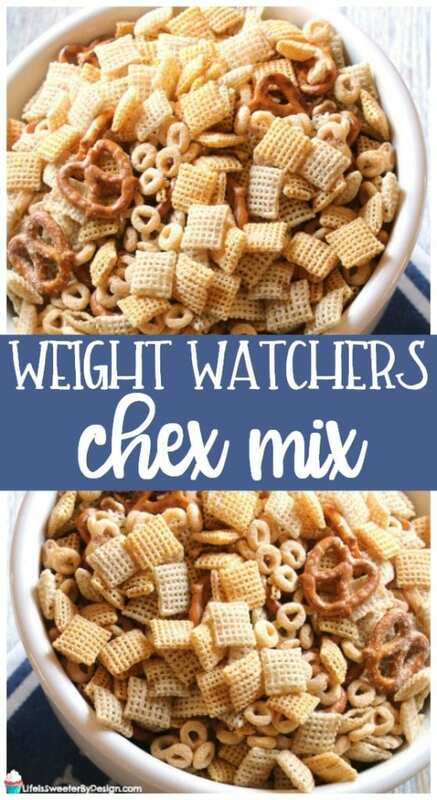 Weight Watchers Chex Mix is a healthier version of Chex Mix and is delicious! This is the perfect Weight Watchers snack recipe! Combine all cereals on a sheet pan and cover it evenly. Lightly spray with butter cooking spray. and then drizzle with Worcestershire sauce. Drizzle mixture with Worcestershire sauce. Combine remaining seasonings in a small bowl and sprinkle over the mixture. Bake at 200 degrees for 1 ½ hours, stirring the contents of the pan every 30 minutes. Cool the Chex mix and then store in an airtight container. This makes 9 one-cup servings. Weight Watchers Freestyle SmartPoints are 3 points per cup. The pictures show this with pretzels....but after making it I realized that pretzels are just too high in points to make this a low point snack! So I did not include pretzels in my calculations! If you want to add nuts or pretzels you will need to adjust your calculations. Remember you can always use more or less of the Worcestershire sauce and spices depending on your personal preferences. I love Chex mix, will try this version.